The Kingston Dragon Boat Festival took place on Saturday, September 21, 2013 in Kingston's Inner Harbour. The Rehab Team consisted of 20 students and staff. It was a great opportunity to connect with students in other programs, as well as to interact with fellow classmates. In the end of a tough day of cold rain, the Rehab Team took the silver medal of the 'C' division championship! 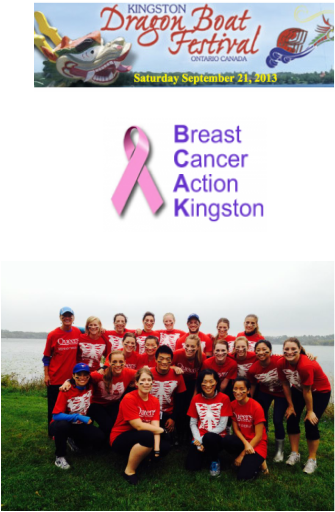 The Rehab Team, with the support of the Society for Graduate and Professional Students, contributed $700 to the festival charity of choice, Breast Cancer Action Kingston.